Charge your glasses folks… for it’s birthday time again. This week saw the launch of the Princess range back in 1975 – this was another Harris Mann-styled car but one which, at least, stayed pretty loyal the artist’s original vision – unlike the Allegro two years earlier. The sleek aerodynamic body hid a thoroughly conventional drivetrain with power units carried over from the 18-22 Land Crab it replaced but the improved Hydragas suspension gave a superb ride which came pretty close to matching the very best for pure waft-ability. Original engine options were the well-proven 1.8-litre B-Series and the 6-cylinder 2.2-litre E-Series with choice of a 4-speed manual or 3-speed automatic. Despite the car emulating the shape of a large five-door hatch, the Princess was launched only as a saloon – BL opted not to take the shine off the upcoming SD1 even though the car was envisaged to have a tailgate from the outset. Some say this hampered sales from word go and the huge amount of passenger room would have worked hand in glove with a tailgate, but we had to wait till 1982 for that to arrive as the Ambassador. As expected with a new Leyland car of this era, the Princess soon got off to a somewhat faltering start. The six cylinder manual cars ate their inner C.V joints at such an alarming rate that BL were forced pull the model from sale while they investigated the cause. An engineering blueprint blunder meant that the angle the driveshafts operated were way beyond tolerance and consequently cost BL a small fortune in warranty claims and irate customers. All this was taking place as the company ran out of money and became part-nationalised. BL tried so hard to make the quirky styling work in its favour. But what it fatally forgot was that Mr Average was its biggest potential customer and owing to a lack of practicality and the cars worse than average reliability, he took heed of the above advert and bought elsewhere. The Princess 2 of 1978 received a needed boost with a brace of new engines – the O-Series in 1.7-litre and 2.0-litre guises, and the dropping of the Austin, Morris and Wolseley versions. It was also the only car in the British Leyland UK range that had no brand as such – its official title became Leyland Princess. Smooth and relaxing to drive with a colossal amount of interior room, the Princess was constantly praised by the motoring press for its comfort but thumped for its leisurely performance – even in 2.2-litre tune – while long-term magazine tests often found the car poor in terms of reliability. The well-recorded, cash-strapped crisis with BL meant the Princess was, at best, only kept competitive through aggressive pricing and minor nips and tucks – O-Series engine aside. It never shrugged off a reputation of shoddy quality and other Leyland-related woes which was a crying shame as they drove so well in good fettle. They soon became known for rumbling wheel bearings, transmission failure, rust and pretty much everything a 1970s BL car was known for – unforgivable for a vehicle aimed at the lower end of the premium marketplace. By the time 1982 came along, other rivals stood head and shoulders above the Princess for performance, quality and image perception – which was a real shame. The Austin Ambassador was heavily based on the Princess but sported that all important tailgate and radically improved engineering quality, but the game was up by now. Faced with technically superior rivals such as the Cavalier Mk2 and Ford Sierra, the Ambassador trundled on for another two years and retired from office in 1984. Looking back with a forty-year hindsight, the Princess could have been a real winner. Personally, even if the build quality had been good from the start, I still think it would have sold well, it wasn’t what the public wanted, and more especially the fleet managers. ADO77, the RWD Marina replacement, would have been a far better product to launch in the mid 70s, the Montego may have been FWD, but spiritually was much more of a Marina/Ital replacement than a Princess/Ambassador replacement! I still think it WOULDN’T have sold well. Slight typo there! It always bemuses me how British Leyland managed to put a five speed ‘box in the sump of an E4 but could only fit four cogs in the sump of an E6. I doubt they would have sold a single car more if they had added a 5th gear. This car, given its place in the Leyland Range and given it was 1975 needed to be shorter, lighter, rear wheel drive and with steel suspension. And they could have done that quite easily using SD1/TR7 running gear and the O Series. 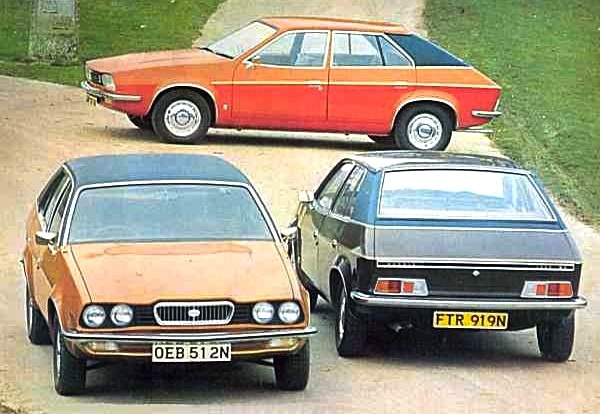 The same car could have also replaced the hapless Marina and the pensionable Dolomite, dramatically tidying Leyland’s unrelated collection of rag-bag saloons and putting an end to the internecine battle between the Allegro and the Marina. Someone did mention the gearbox used on the E4 couldn’t cope with a larger input. The 1800cc B series engine seemed an odd choice considering the 1750cc E4 was available, but IIRC American sales were planned & the B series being OHV & passed for emissions seemed a safer bet. It’s a car that only seemed eventually evolve into the car it probably should have been at the start, even if some there are certain areas to commend it. It looked great, an I well remember reading Autocar avidly hoping my dad would be able to afford one. The hydragas suspension may have made for a good ride but the handling was stodgy at best and nowhere near as good as the competition. Add to that the stodgy handling, ancient engines and notchy gearchange with the legendary BL [lack of] build quality. When it came round to us being able to affor one, the reputation for unreliability meant that we settled for a dull but reliable Marina instead. 40 years on, I still love the shape. Nothing in its class rode as well, had such massive interior space and offered such a relaxing, if not particularly fast, drive. Sadly the Princess suffered from awful reliability at the start, it was made in a strike prone factory and when it did come good in 1978, it was too late. However, I often wonder if a five speed gearbox and fuel injection on the 2.2 model, could have really made this a desirable car. I suppose the nearest direct rival would have been something like a Renault 20, something that also majored on space and comfort, and was also a bit slow and stodgy! A shame they didn’t stretch the 2.2 up to a 2.6 using the same mods that turned the 1500 into the 1750. Jon – the 2.2L E-series was given exactly the treatment you suggest and used in 2.6L form in Australia and South Africa. Was only used in RWD cars like the P76. Yet another dreadful British Leyland car ! You do have to wonder how they managed to struggle on for as long as they did. I have to say, though, they did manage to have a good ride quality, something so lacking in today’s cars with their stupid large diameter wheels and low profile tyres. I have owned a Wolseley 18/85 and an Ambassador. The Wolseley was a fabulous car, comfortable, spacious and with a luxurious interior all within a fairly squat length. The Ambassador and direct descendant of the Princess was a completely different vehicle and not a patch on the 18/85. Mine was an early one (and a few years old when I bought it) and no problems with the gear change (was an auto but when that went pop I put in a manual box). A colleague had a new Morris 1800 and had no end of problems with the gear change and always moaned that mine was far better. @ Fraser Mitchell, at least the Princess looked distinctive and fwd was still rare in a class where three box rwd cars dominated. It didn’t generate the same kind of antipathy among testers when it was launched like the Allegro and Marina did, but sadly reliability issues and strikes soon kicked in to ruin the car’s chances. Had the Princess been better built from the start with five speeds and fuel injection on the top models, then it could have really scared the Cortina. I remember seeing my first one whilst waiting for a school bus one morning, it was a white 1800 HRD707N and was the managers car from a small sleepy Austin dealer at Crowthorne in Berkshire. At the time it was such a radical shape that, along with fellow teenage school car nut friends we likened it to that “Concorde Moment” in British automotive history! I remember thinking a late Princess 2 in HLS spec looked great! There were also quite a few compliments in magazine group tests circa 1981. @ Dave, the quality was acceptable by the end of the car’s life and the car had come good by the eighties, but as usual, it was too late, the Princess’s reputation had been damaged early on. I still think the Ambassador is a good car, the quality and reliability on these was generally acceptable and it had a hatchback, but was let down by still having a four speed gearbox and a cheap looking interior. No, Ambassadors suffered from the crankshaft pulley shearing its woodruff key and rotating on the shaft. I liked the Ambassador but felt it a bit bland in some respects compared to the Princess. The six window styling, hatch and new rear looked good. However, the headlights, grille could have been more characterful and why do away with the Princess’ steeper bonnet, concealed wipers? A full instrument pack alone would have helped the new dash greatly. I was privileged to have some of the first 18-22 cars on my Kenning Car Hire fleet in Ilford and East Ham. 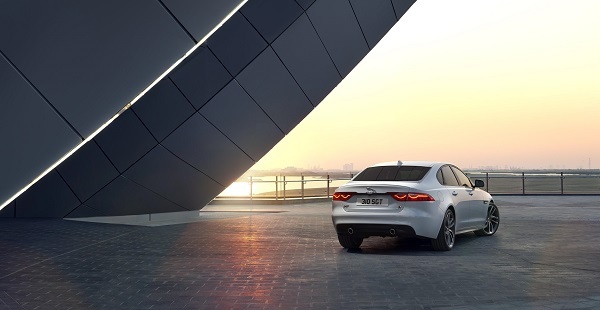 Futuristic looks, loads of space and comfortable ride. Shame about BL’s quality at the time. Only this week Quentin Wilson described his fathers O-series Princess as “junk”. The late John Deborough, one time chief political correspondent of the Daily Mirror, told me the Princess was the worst car he ever owned. What is clear is that there was no meaningful quality control at Cowley until the Graham Day era. The Longbridge produced cars were by no means perfect, but one hears less horror stories about them. Much maligned as the Allegro was, after the initial glitches, it seemed to settle down to evolve as a reasonably reliable product. Mention of the Princess usually produces horror stories. BL would have died sooner had Cowley produced the Metro. Mike, the Austin/Morris/Wolseley names were supplanted by the Princess badge in September 1975, not at the 1978 Princess 2 stage, making the 18/22 cars and especially the Wolseley the rarest of cars. The B Series was used purely because it was forecast that the Allegro and Maxi between them would soak up all the production capacity for the E4 engine, though the early intention was indeed to use the 1750 E Series with 5 speed box. Personally, I think that the torque characteristics of the B Series were better for the heavier car. Investment constraints prevented a 5 speed box – we had to use the existing Land Crab transmission, which used the very robust basic C-series gear train that was common to MGB/MGC/Austin 3 litre/Sherpa. It wasn’t possible to use the long-stroke 2.6 E Series on the transverse transmission, there simply wasn’t space for the swing of the crank – and it would have overlapped too much with the SD1 six cylinder cars. I don’t know anything about a ‘blueprint blunder’ on the driveshaft – I did, however, see a drawing that showed the maximum compound angle at eleven degrees, which was actually within GKN’s specified tolerance, so it SHOULD have been OK. In fact it only took a small shift of the engine mounting points to fix the problem, and the automatic transmission version was OK anyway. This leads on to a general comment about supplier contributions to Princess quality issues – much of the work done to create the much better Princess 2 of 1978 was carried out by analysing supplier processes – for example the bonded rubber slab mounts for the rear suspension cross tube failed because the maker simply put too many of the raw steel plates into the cleaning barrel process at once, thus ‘masking’ some of the surfaces – so the subsequent rubber bonding wasn’t as strong as it should have been. It was found that the (German!) maker of the exterior door handles was linishing the raw Mazak castings too much, taking off the corrosion-resistant ‘skin’, which led to pockmarked chrome – and so on and so on. Mike’s absolutely right about one thing – a properly set-up Princess was an extremely comfortable and refined drive – a good 2200 compared very well with an XJ6. Can you email me, please at leylandprincesss@aol.com I’d like to know more about your ADO71 associations if you’d be kind enough to share them. The first time we had a Princess into the garage it was a revelation.At the time i thought the fat low profile tires and the narrow wheels were bizzare but i loved the way it drove.It made the Toledo’s and Dolomites that i PDI’d every day seem so out of touch. I recall the launch of the original (Princess) range in 1975. 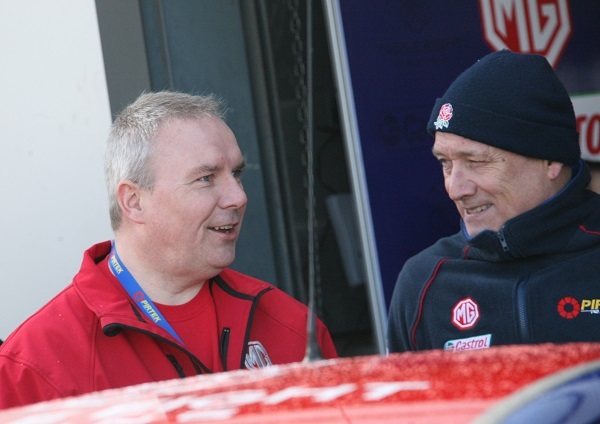 In the press it was described as the car that must succeed to save BL. Although every new BL car was described as such back then! Having said that the Princess models I rode in were roomy inside and very comfortable. The later Princess 2 models looked more appealing and as said here, quality had improved by then. The hatchback arrangement on the Ambassador was welcome but too late sadly and so it missed out in the popularity stakes. The consensus is the Princess came good when the new O series cars were launched, which gave them better economy and better refinement( although the B series cars were still fairly quiet).For all the Princess had its knockers, as with all British Leyland cars of this era, I knew of several people who owned them and generally found the later cars to be reliable and well made. Also this talk of rust on here, I don’t think the Princess had many rust issues and seemed to last a lot better than Mark Four Cortinas and many continental cars. The Wedge was a great car crying out to be built correctly. I love the wedge. It had heaps of wasted potential. I was “inspired” by the wedge when I created a set of bodyshells for a Car Tycoon game in development. I suppose there are similarities between BL and Citroen. BL being innovative with the wedge shape – something different and Citroen with their love of hydraulics. Peugeot put paid to Citroens efforts and perhaps the British car buyer was a little staid in their styling preferences. Mind you industrial disputes do not help. I know from personal experience that at one time a shortage of drive shaft flanges meant that spares for existing cars were not available as all that existed were earmarked for the production line. Another car mis-aligned in the market place. Joe Public and Mr Fleet buyer wanted 1600 and 2000cc. The ADO 17 failed because it was a bit too big for it’s target audience- and ten years later BL made the same mistake replacing like for like? I confess to liking the Princess and Ambassador. BL could have made it really good and saved money by not doing the O-series, which I believe started as an OHC B-series. The natural choice would have been the Triumph Slant 4 in 2.0 or 1.8 but brought in from Saab which was reliable, fwd and 5 speed. A turbo Princess is a tempting choice too. @ PaulT, the militancy of the unions never helped British Leyland’s case. You’d have thought nationalisation under a Labour government would have helped the strikes die out, but they continued for the rest of the seventies, causing the closure of the factory in Speke, where workers in an area of high unemployment probably had a massive struggle to find work afterwards. Indeed it makes you wonder if a lot of politically motivated shop stewards really cared about their members, or saw them as some kind of pawns in a game to create a Marxist society few people wanted. I wondered that too, or the unions had too many members too willing to screw as much as they could out the system. It seemed to go from fighting a war they had already won to fighting a war they had already lost a decade later. July 1974 I was in my first and last year as a apprentice motor mechanic.I hated it probably because it was a one man band and all we did was weld rust and slapped filler on.The main dealer down the road was BL and we got an invitation(the boss dragged me along)to see the new Princess.Obviously a pre production or demo.Everybody loved it and most thought it was called the Wedge!Presumably after Wedgie Benn. I was so impressed I bought one in around 1978ish.Oh dear,I should have known by my year long experience,yes welded rust and filler.It was comfy however.I seem to remember something about idler gear!!!! In neutral it grumbled a lot.I’m sure a proper mechanic will explain. Good Looking car spoilt by lack of development and management – sounds like British Leyland full stop. My father had a Princess 2 2200HL from new before that he had to 1800 land crabs, one Morris the second Austin. Later I bought a second hand Princess 2 2000HL. I do not recall any reliability problems with the 2200 and it was used to tow a caravan over the Alps on a number of occasions. Very smooth car. It was because of that car I bought my 2000HL which I ran for about 3 years. I did have one reliability problem with my car. The pulley on the alternator split leaving me stranded on the A38. A fifth gear for motorway cruising would have been an improvement. Also the main dashboard moulding was a bit cheap and shiny. While the dash was far more modern looking than the one in the Land Crab it did not feel as solid. After having a number of cars with stiff suspension I have now returned to wafting with my current car, a Jaguar XJ. @ Dani, the Princess would have been a competitor for the CX and like the CX, a very commodious, distinctive and extremely comfortable car. However, both were misunderstood at the time, the CX was seen as a complicated car to maintain and hence used values were always low in Britain as mechanics found them difficult to work on and quality was never great, while the Princess was seen as part of the evil empire of British Leyland and laughed at. Fair points Glen, though the CX had the task of replacing the DS, & had the break estates which the Princess didn’t have, though there were some nice looking hearse conversions. Inside the Princess and Ambassador was a great car trying to get out. Unfortunately, it never quite escaped. Lack of development, 2nd rate engines and gearboxes and the often distrusted Hydragas suspension coupled with the notorious militant union inspired build quality. Uninspired and dodgy marketing strategy and criticised for lack of a hatchback. Errr… how many BL projects have a similar story? @ Tony Evans, true in some cases, but by the turn of the eighties and a massive drive to get the quality up and the number of strikes down, the Maxi, Princess and Allegro had turned into reasonably reliable cars that were good value for money and aggressively discounted to shift stock. I think by the end of its life the Princess was a fine car and an interesting alternative to a Cortina, whose reliability wasn’t much better( starting in the wet was a bit of a chore AIRC). 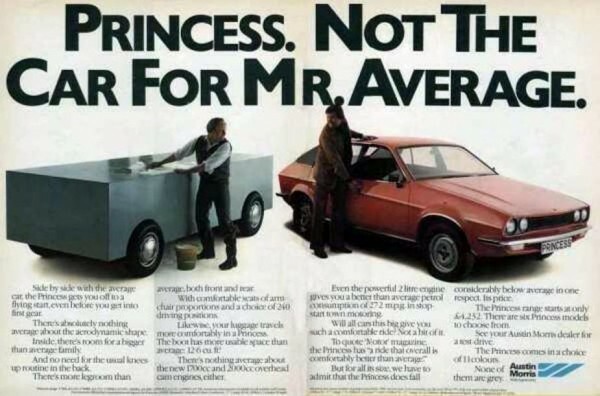 In contrast, while the Princess/ Ambassador was a reliable car by the end, the Montego that succeeded it was a joke, and made even a 1975 Princess look like a Mercedes on comparison. I never warmed to the M cars until the Rover era and even then, it was only the diesels I considered worthwhile. You are absolutely right, but by then the damage was done. I never liked the Cortina anyway, most of my cars in that era were Triumphs — mainly 1500 and Dolomites, so I was a bit pampered (my father had a Triumph 2000 followed by a Marina). The Cortinas I tried were pretty stodgy and I was never inspired enough to want one. I still think that the Princess shape looks great. The car has aged well. You are totally right about the M cars too, but by that stage I had moved onto Vauxhalls which were so much better in my experience. @ Tony, the Cortina only made sense if you could afford a GL or a Ghia, the more basic cars were austere and didn’t go in 1.3 litre form. Also for all the Cortina looked good, I always found them thirsty and sluggish unless you could afford the biggest two engines. The Princess in contrast wasn’t too bad on petrol if you had a four cylinder car, rode better, had more interior space and looked more radical. I did wonder if the Princess could have been built a bit lighter to cope with just an 1485cc E series engine & get a bit more of the fleet market from the Cortina. With the 1750cc E series it wouldn’t have needed the B series to start with. With the smaller engine & hatchback it could have possibly replaced the Maxi. @ Richard 16378, the 1.5 litre engine would have made the Princess struggle and also would have defeated the object of the car competing against bigger engined Cortinas and lesser Granadas. In 1.7 litre form, which gave the Princess a useful raise in fuel economy for no loss of performance against the old 1.8, the car was better to take on the Cortina. I think the O series was more or less the same economy wise as a Cortina, but offered more space and a better ride. It’s not that I’m anti Cortina by any stretch of the imagination, the car was a huge success and offered a version for all types of buyers, just basic versions were too stark, the 1.3 had no power and the 1.6, while acceptably quiet, was thirsty and a bit sluggish. You really needed the two litres and the 2.3 V6 to get any real luxury and performance out of a Cortina and then the downside was lower fuel economy, although the V6 in Ghia form was a very nice place to be. If I had a wedge of money I’d buy a Princess. I’d do a nut and bolt restoration and modify it to make it the car it should have been. One of my first cars, in 1992 was a V reg Princess 2 2.0HLS. It was given to me free by the man who had owned it from new. It had 6 months MOT and no chance of passing another without major bodywork but it was sublime to drive. The 2.0 provided enough grunt whilst not bad on fuel and there were fold down armrests in the huge armchair like front seats. On motorways it just wafted along, the lack of 5th gear never really apparent. When the MOT was up, I managed to get, free, a 2200 HLS with excellent bodywork and a cracked engine block. I just transferred all the excellent mechanical bits from the old one into the new one, it lasted for years. Despite never being altogether happy with the way it looked- the reaR light treatment and the tail up stance looked wrong to me-they made for very cheap motoring, Princesses at the time were utterly worthless and firmly in banger territory. The scrapyards were full of them. Has a close reminicent of Alfa´s GTV wedge-shape seen from the front and side angles, especially the Wolseley version seen in that front angle has the closest similarities, withe the quadruple headlights. Always wonder what a Vanden Plas Princess would have been like if Kingsbury had been given the go ahead to make one. I could imagine a wood and leather Princess with Wilton carpets and rear picnic trays being like a Daimler Limousine for considerably less money, and the E6 mated to an automatic transmission would have made the Princess Rolls Royce like, Also a few tweaks like a Vanden Plas grille and retainining the nicer four headlamps over the trapezoidal units would make the VDP Princess stand out.